Jiebing Chen has been hailed as one of the foremost erhu virtuosos in the world. Chen's incredible musicality and interpretive skills have resulted in overwhelming international acclaim as a solo interpreter of her instrument. Beyond that, with Chinese, American and European orchestras Chen was the first to bring the erhu into the symphonic concert hall, performing as a featured soloist. Her playing brought a new sound and excitement to classical music audiences. Perhaps most compelling are her achievements as a cross-cultural performer. Chen has virtually reinvented the erhu for the 21stcentury, performing in partnership with some of the most notable jazz and world music artists of our time. Her artistry has made her the most recorded erhu artist in the world with over 20 CD titles available internationally. In addition to her classical repertory Chen's work received a Grammy-nomination for Best World Music Album for her jazz improvisations with Bela Fleck and Vishwa Bhatt. Jiebing Chen began performing at age 6 in her native Shanghai. Recognized as a child prodigy, her talent was saved during the Chinese Cultural Revolution when, at age 9, she was taken into the Chinese Navy Orchestra, (one of China's few musical organizations). As a very young musician she found herself playing martial music along with performing in the orchestra that accompanied Madame Mao's 'model operas.' As changes in China took place, Chen studied and graduated with top honors from the Shanghai Conservatory of Music in 1982 after studying under China's most distinguished musicians. That same year she won first prize in the National Competition of Traditional Instruments in Beijing, sponsored by the Ministry of Culture, the first year it was held following the Cultural Revolution. 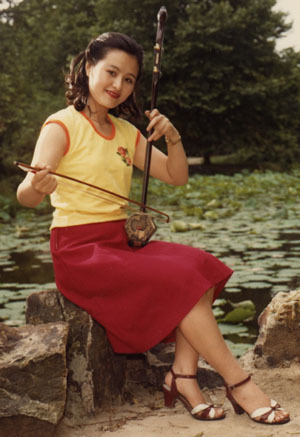 Shortly following these concerts, she made her first recording on a major label, Jiebing Chen Erhu Recital, the first solo recording of the erhu by industry leader, China Records. Five years later, Chen was the youngest performer to be named "National First Rank Performing Artist," the highest honor the Chinese Government awards to artists in recognition of their talent and achievements. As a soloist with the Shanghai Symphony and Chamber Orchestras at the Shanghai Concert Hall, Chen performed for the first time using the erhu as a solo instrument with Western orchestral accompaniment. 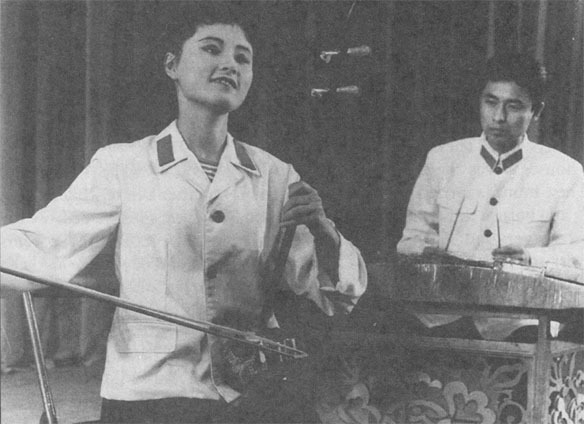 These broadcasts and others on radio and television in China brought Chen enormous popular acclaim and special recognition as one of the few erhu virtuosos in China. Since 1988, Jiebing has frequently appeared as soloist with the Shanghai Symphony Orchestra, the Shanghai Chamber Orchestra and the Shanghai Opera House. Chen then began to tour Australia, Asia and Europe as a Chinese cultural exchange artist in "Marvelous Strings". 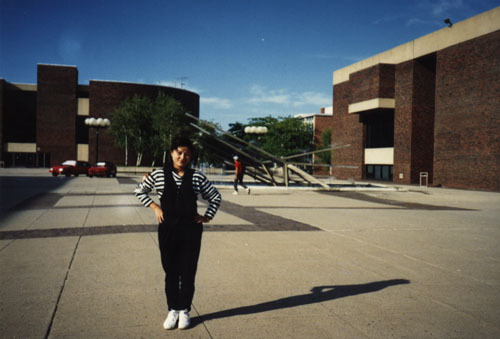 In 1989 Chen came to the United States to study at the State University of New York in Buffalo, receiving a MA in Music Theory. The total freedom Chen felt in the United States deeply affected her exploration of the possibilities for her instrument and the ways in which the erhu could be integrated into the classical and contemporary repertory for orchestra, along with other music styles, including jazz and Indian classical music. 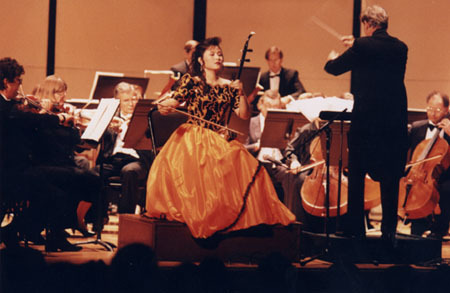 Jiebing performing with an American orchestra in 1994. Her appearances as a featured soloist with orchestras include dates with Buffalo Philharmonic, the San Francisco Symphony, the New Moscow Symphony, the Hungarian Symphony, Taipei Municipal Chinese Classical Orchestra, Manitoba Chamber Orchestra, the New Century Chamber Orchestra, the Hollywood Bowl Orchestra, Los Angeles philharmonic, and others. Besides performing as a featured soloist in classical concertos, her contemporary work as a soloist include "Double Concerto for Violin and Erhu", "Concerto for the Erhu and Hammer Dulcimer", "String Calligraphy", "Awakening for Erhu and Orchestra" and "Fiddle Suite for Erhu and String Quartet". Stepping out in a new direction, Chen began performing a series of concerts with the Jon Jang Sextet and The Billy Taylor Trio in New York City. 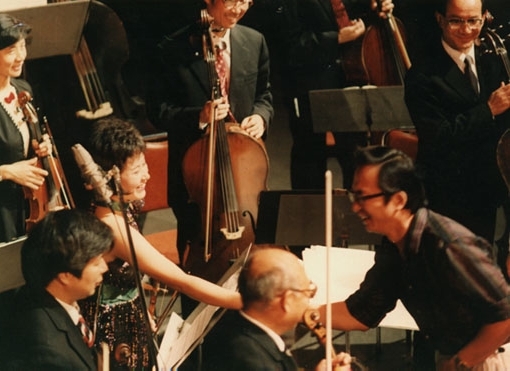 These successful events led to even more innovation and in Beijing in 1998, Chen performed on her erhu with the Jon Jang Sextet at the International Jazz Festival with James Newton, Jon Jang, Santi Debriano, Billy Hart and David Murray to great audience acclaim. With fast-rising recognition and success in jazz and world music, Chen recorded with the well-known American banjo player Bela Fleck, flutist James Newton and Indian violinist Subramanian. Her CD, Tabla Rasa, a collaboration with Bela Fleck and Vishwa Bhatt, was nominated for a 1996 Grammy Award for Best World Music album. Jiebing and the Beijing Trio. Pictured here is Jon Jang (left), Jiebing Chen (center), and Max Roach (right). A new and acclaimed partnership was formed in 1999 when The Beijing Trio came into being. In that year, Chen began a stellar collaboration with pianist and composer Jon Jang and legendary jazz percussionist Max Roach. Dedicated to fresh East-West jazz-fusion, the Beijing Trio has toured European and U.S. cities with dates at the jazz festivals of Switzerland, Berlin, Milano, Chicago, Boston, New York and other cities. Downbeat Magazine handed five stars to the Beijing Trio. Chen has also made history as the first erhu player to perform with Indian artists, and made special appearances as part of the 4th East West Music and Dance Encounter in Bangalore, India and has toured India with famed mohan vina interpreter Vishwa Bhatt with Vikram Ghosh on tabla. Most recently, Chen made her debut with the Philadelphia Orchestra Opening Night Gala in 2014. Prior to that Chen was a guest artist with the Philadelphia Orchestra in their annual concert tours in China. In addition, she and members of the Philadelphia Orchestra formed a 4-member ensemble and toured many Chinese cities bringing together the culture of China and the western world. Chen was featured on the Chinese Radio and CCTV programs. Jiebing Chen's career is still unfolding. Her horizon seem limitless. Chen's virtuosity and approach to the possibilities of her instrument continue to be groundbreaking, inspirational and delightful.